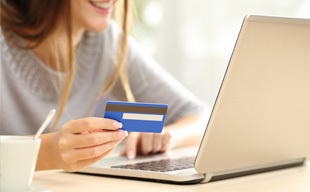 The digital revolution has made it easier than ever to sell online. From specialty animal care products to handmade soaps to personalized jewelry to leather goods, the sky is the limit when it comes to starting a small business and achieving online success. Furthermore, the online sphere has expanded the world of brick and mortar businesses, allowing even the smallest mom and pop to open their e-doors and transform a neighborhood establishment into a brand available worldwide. None of this is possible, however, without an intelligently designed and thoughtfully maintained payment solution. The best online businesses are underpinned by a reliable, user-friendly ecommerce payment processing platform. This enables you to transact with consumers simply and easily, even while you sleep. Now the question becomes: What system should you use? The best user experiences happen all under one umbrella. Every time you have to send a customer to another link or make them jump through another hoop, your chances of completing the sale go down. If customers feel like purchasing from you is a hassle, they’ll quickly find a competitor who makes the process simpler. You can’t afford to lose out on business because of a simple technical issue. We offer the perfect solution, combining your ecommerce and shopping cart payment solutions to provide a top-shelf experience for consumers. We make payments simple, enabling consumers to shop using smartphones and other devices. Your store thus becomes mobile as well as online, significantly increasing the number of households to which your products have access. When combined with an attractive and intuitive website – with which Merchant Tree can also help you – the result is an ecommerce site without peer, and a business that can’t help but succeed. Here at Merchant Tree, we’ve spent thousands of hours refining our ecommerce and shopping cart integration services. Our systems integrate perfectly with credit card processing services, are reliable and secure, and offer a rich user experience that will keep your customers coming back again and again. Our unparalleled list of services can be customized to meet the needs of any online shopping site, whether or not you’re integrated with a physical location as well. As one of the foremost merchant services providers for new and small businesses, we know exactly what it takes to bring your business vision into full fruition. To learn more about how we can help you, please get in touch today at (800) 610-3922 or through our website. We look forward to helping your business thrive.